I am super excited to share the most advanced healing upgrades, updates & technologies from the soul assigned divine healing intervention team on earth & in the stars! During this quantum healing activation, I will introduce you to advanced light beings & healing masters from Shambhalla, Arcturus & Sirius in the ancient temples of health, healing & wellness. When you purchase package B, you will receive everything in package A as well as a 30 Minute Etheric Acupuncture Divine Detox Session to Gently Release Density & Debris Held in Your Mind, Body, Spirit & Soul Bodies. 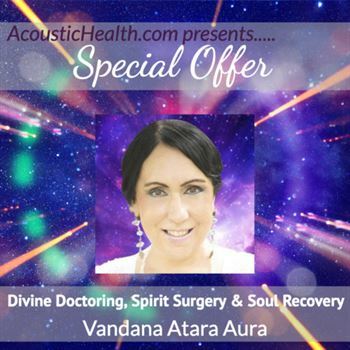 During this session, Vandana will channel the accelerated light trinity team, Reiki Doctors & Spirit Shamans to identify root trauma & core programs that won’t allow you to heal. Your Parasympathetic Nervous Sytem Will Be Re-Wired & Restored to RE-SET your molecular structure on a sub-atomic level to include inherited patterns & programs that keep you stuck in endless stress, struggle & suffering. To conclude your session, you will be introduced to a divine healing guide so you may receive continuous healing, insights & information to complement & supplement your 3D medical care. Meet with Vandana by phone, skype or in the zoom room. Each session will be recorded. “I discovered Vandana’s work recently and she is beyond-phenomena! Many, many shifts have taken place since I first listened to her transmissions from family clearings, to soul retrievals to deep emotional trauma release and working with the Akashic records. Her gifts are more than I can describe here. On the night before a Court Case last month, Vandana was ‘guided to connect with me’ during an intense night before the Court appearance. I am amazing how she knew I needed support and her guidance was spot on to connect with me at a very low point that night… And the most amazing thing… I have not even had the pleasure yet of working directly with her, or any of her show packages. I just know that beyond-rapid shifts are occurring just from hearing her voice. So many, many, many blessings since discovering Vandana’s work.” ~ J.M.N. “I wanted to say thank you for the incredible class yesterday and the personal work you did on me as the surrogate. It feels like you saved my life. I was completely clouded and disoriented and for the last 24 hours I have felt clearer and happier. I have felt more like myself then I have in a long time and ready to take the next steps on my highest path, whatever they may be. Thanks again for the Akashic Records training classes. I feel better than ever and the wisdom to trust is helping tremendously. ” ~ M.C.